OK let's get the sad news out of the way: one of editorial team and a key member of the JBoss family is leaving! Good luck Markus and come back soon! Now that's out of the way we return you to our normal scheduled service. And as usual Eric has been doing a great job of pushing the OpenShift+JBoss agenda. Whether it's the Container Development Kit (CDK), with it's integration through Eclipse, or just installing OpenShift as a private PaaS, Eric always manages to get straight to the point and in an easily understandable manner. One of our relatively newer projects, APIMan, has had a few articles in the last week. Len has written about improvements on plugin management, which is really a key area for APIMan and Policies. Eric, the project lead, has also stepped up to write about how you can republish your APIs, and how you can re-register your client apps. If you're at all interested in API Management, which cuts across a number of different areas, then check out these articles as well as the project. In other news, we've had a really interesting article on testing and Ceylon, Heiko has written about the work they're doing with integrating JBoss Management and ManageIQ (a very important step! ), and Keycloak 1.9.0.Final was released! Congrats to the team. OK, that's it for this week. See you next week! The day first became associated with romantic love within the circle of Geoffrey Chaucer in the 14th century, when the tradition of courtly love flourished. In 18th-century England, it evolved into an occasion in which love interest expressed their love for each other by presenting flowers, offering confectionery, and sending greeting cards (known as "valentines"). In Europe, Saint Valentine's Keys are given to love interest "as a romantic symbol and an invitation to unlock the giver’s heart", as well as to children, in order to ward off epilepsy (called Saint Valentine's Malady). 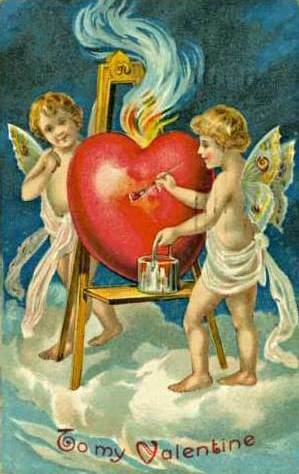 Valentine's Day symbols that are used today include the heart-shaped outline, doves, and the figure of the winged Cupid. Since the 19th century, handwritten valentines have given way to mass-produced greeting cards as seen in the attached image. Teiid 8.13.1 is now available. It is a fix release addressing 15 issues. Hibernate Validator 5.2.4.Final is now available. This is a bugfix release which addresses two issues around one of the more advanced features of Bean Validation and redefined default group sequences. Hibernate ORM 5.0.8.Final has just been tagged and published. The complete list of changes can be found here (or here for people without a Hibernate Jira account). JBoss Forge 3.0.0.CR1 is now available. Grab it while it is hot! Infinispan is proud to announce two fresh releases. First is 8.2.0.Beta2, from our development branch. The second is 8.1.2.Final which contains bug fixes. Eric Schabell continues his tour of the Cloud stack continues from his previous article in a series where he laid the first foundational bricks, the reliable and container supporting operating system. The core machines on which our Cloud will rest, that support containers but obviously don't do much more than that. You can find more of articles in the series listed below. This coming Spring there will be a CodeMotion conference in Amsterdam in May from 11th - 12th, 2016. The Call for Papers is open until Feb 15, 2016. Eric shared his talk submissions here. Vlad Mihalcea shared with us the New Hibernate ORM User Guide and the Hibernate Community Newletter. Starting this year, they are hosting a series of articles focused on the Hibernate community. They share blog posts, forum and StackOverflow questions that are especially relevant to their users. Also, they announced that the new Hibernate ORM User Guide has become the default Hibernate 5.1 reference documentation. This process was started last summer, and it was one of the primary goals of the Hibernate 5 project version. Edson Tirelli announced that Red Hat will be hosting a free webinar on Tuesday, Feb 23rd, on Decisions-as-a-Service with Drools/Red Hat BRMS. This is the perfect opportunity to watch how easy it is to author and publish decision services with Drools/Red Hat BRMS. For more details and to register, click here. Stan Silvert attended DevNexus in Atlanta and discusses the JSON Web Tokens (JWT). this is a non-portable way to get around the CDI spec restrictions, see also Proxying classes with final methods and CDI-527. use with caution! This week, we have two new releases of Keycloak. As 1.8.0.Final was released before WildFly 10 Final was available, we decided to release 1.8.1.Final which is now built on top of WildFly 10 Final. The bigger release today is 1.9.0.CR1, this release contains a large number of bug fixes and improvements, but no major new features. For the full list of issues resolved check out JIRA and to download the release go to the Keycloak homepage. The release contains many bug fixes and a ton of small improvements, such as future composition, improved Ceylon support, Stomp virtual host support, performance improvements… . The complete release notes are there. The event bus client using the SockJS bridge are available from NPM, Bower and as a WebJar. The next version would be the 3.3.0, and is expected ~ May 2016. It's not a major release, but it has plenty of bug fixes, a few interop improvements, and more importantly it's the first non-yearly release, as we're moving to a more rapid release cycle. Yeah, sure now people brag about doing multiple daily releases, but three months is still better than one year, we'll see later for more rapid cycles. For those wondering about IntelliJ support, we're about two months away from a first public release, and we'll have Android+Ceylon news before that. I hope this week's editorial has provided you with something of interest, please join us again next week when we will bring you more news from JBoss and the JBoss Communities. There is a saying that "Good things come to those who wait" and this is certainly true for those who have been waiting on the WildFly 10 release. WildFly 10 Final in all its goodness has arrived and is now available for download from the usual place, so what are you waiting for? If you want more information on the release then check out Jason's and/or Dimitris' announcement. For the last couple of months Ioannis has been experimenting with Jenkins to work out how it could be integrated into a Docker/Kubernetes environment. The culmination of this effort has been the creation of a Kubernetes Workflow Plugin, a plugin to Jenkins that provided support for many Kubernetes concepts including pods, build images, service accounts, volumes and secrets. The release of Infinispan 6.0 came with some significant changes including to their Cache Store SPI. The unfortunate outcome of this change was that some of the "extra" cache stores that had previously been developed were no longer able to work within Infinispan 6.0, the Cassandra Cache Store being one example. Happily this is no longer the case as Jakub Markos stepped forward and took on the task of updating the integration so that it is now compatible with the new SPI. The second Hibernate Community newsletter has just been released, this forms part of a series of articles that are focussing on any blog posts, forum discussions or StackOverflow questions that are relevant to the Hibernate Community. The fabric8 team have recently released a new maven plugin that will allow you to validate your Camel endpoint configuration from the source code, ensuring that you catch any errors before they get deployed into your environment. For more information check out Claus' post where he includes a video to demonstrate how the plugin can be run from within your IDE. The Infinispan team were in London last week where Gustavo Fernandes presented a tour of Infinispan 8 at JBUG: London, if this of interest to you then check out the video of the event. They were also present at Snowcamp 2016 where Galder Zamarreño gave a presentation on "Distributed Data Processing with Infinispan and Java Streams". Devoxx UK will be returning to London this Summer from June 8th until June 10th and we intend to be there. Eric Schabell has teamed up with Markus Eisele to propose two sessions for the conference, "Super charging your IDE for container based development" and "Awaken the force in your developers with OpenShift & Wildfly Swarm". Eric has also submitted a proposal for DevNation2016, taking place along side Red Hat Summit in San Francisco from June 26th until June 29th, and is entitled "Awaken the Force in your developers with containerized Cloud & JBoss xPaaS". The Arquillian team busy this week with the announcement of Arquillian Core 1.1.11.Final, Arquillian Container Jetty 1.0.0.CR3, Arquillian Universe 1.0.0.Alpha2 and Arquillian Drone Extension 2.0.0.Beta1. The Keycloak team have announced the release of Keycloak 1.8.0.Final, Keycloak 1.8.1.Final and Keycloak 1.9.0.CR1. The Infinispan team have announced the release of Infinispan 8.2.0.Beta1 and Infinispan 8.1.1.Final. The JBoss Tools team have announced the release of JBoss Tools 4.3.1.Beta2 and JBoss Developer Studio 9.1.0.Beta2. The Hawkular team have announced the release of Hawkular Metrics 0.12.0. The Narayana team have announced the release of Narayana 5.2.13.Final. The Weld team have announced the release of Weld 3.0.0.Alpha15.